During this workshop, you will create a small decorative panel of quilted and stuffed fruit, leaves and flowers inspired by Grinling Gibbons and decorative Rococo architecture. 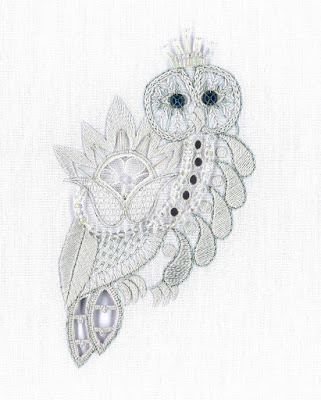 In this workshop, using traditional embroidery techniques, you will create an ornate ‘Squirrel’ and ‘Owl’ worked in embellished White Work techniques, on your choice of background colour. This will combine elements of Broderie Anglaise, Richelieu style cutwork and Mountmellick on linen, embellished with beads & sequins. The ever-popular Nicola is Royal School of Needlework trained. Her work is based on her intricate drawings and paintings informed by natural forms, embroidery and decoration. Please note Nicola is providing a kit for this workshop, the cost is £30 and is not included in your fee. 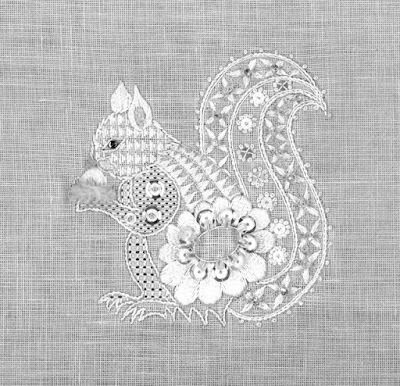 The kit includes a hand drawn motif 35x35 cm, 100% linen square, needles all DMC & Au Ver A Soie threads, beads, sequins, crystals and instruction booklet. Learn to make a textile collage with guidance from Jan. Working from memories of family, a special place you have visited, or a collection of small objects, you will learn how to make a collage, attach the fabrics to the foundation, traditional finger turned appliqué for a flower or bird. Also, simple on-lay appliqué to create a naïve and aged look, embellished with hand embroidery stitches. We can also look at how some traditional patchwork techniques can also be incorporated.